TNT is a cable/satellite channel owned by Turner Network Television. This channel was created in 1988 and was focused on broadcasting TV series, drama movies and awards ceremonies, with some sporting events added to the mix. TNT's sports-related content includes pro and college basketball, added to some golf tournaments. 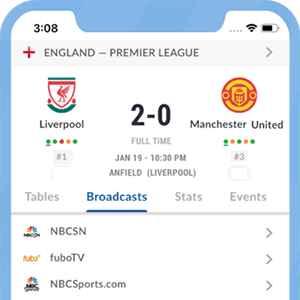 TNT's coverage may also included broadcasting football games from some of the major club competitions in Europe, as well as some European football games from domestic leagues. *Got itLive Soccer TV does not provide TNT live streaming. The information provided on this page is simply TNT soccer TV schedule.